On my morning post, when I wrote about my food rut, Brittany commented, saying that whenever she finds herself in a food rut, she looks back on old blog posts that she published for favorite recipes that may have fallen to the wayside. Smart lil’ lady! 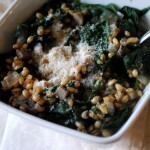 I started clicking around my blog and quickly stumbled upon my butternut squash and wheat berry mock risotto. I loved that recipe! It was a huge hit in our house with both me and Ryan and I figured I could play around with different vegetables and come up with another wheat berry mock risotto dish for dinner this evening. 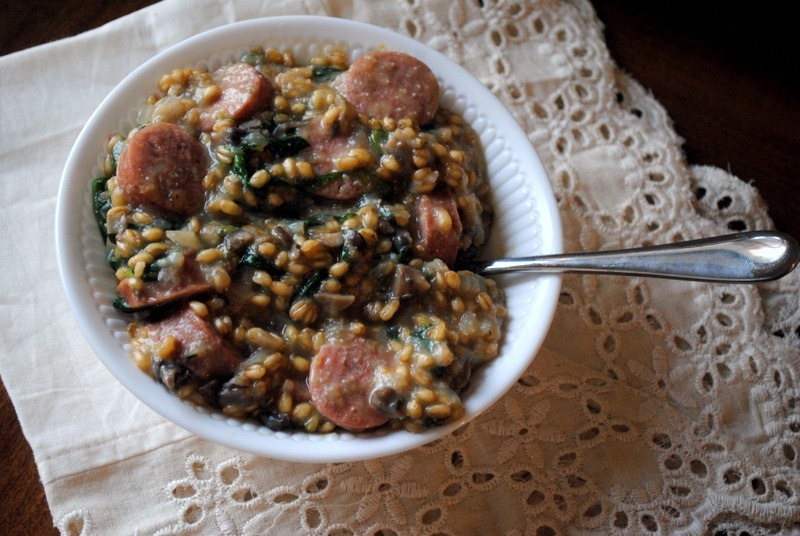 Wheat berries are much chewier than rice and I love the texture they add to a creamy dish like this mock risotto. I decided to use an onion, mushrooms and spinach to add flavor and nutritional value to the meal and it turned out fantastic! This dish can easily be made vegetarian by using vegetable broth and omitting the chicken sausage. Such a yummy meal! After dinner, Ryan and I took Sadie on a 30-minute walk around the neighborhood before coming home to watch Jeopardy. I miss the college tournament on Jeopardy! I was killin’ it when the college kids were on last week and was humbled yet again this evening when the questions returned to their normal level of difficulty. C’mon, Alex! Hoping to cram in some reading before The Bachelor starts. Home town dates tonight! Hm, this sounds good. I’m not really a pasta girl but every now and then a simply risotto sounds perfect. Thanks for sharing! I’m so pumped for hometown dates! This is my first Bachelor experience, so I’m new to it all. My husband and I are loving it though! I was so shocked about Emily last week. She was my fave. I think I’m pulling for Kacie now, since her hometown is pretty close to mine in TN. We’ll see! Do you have a favorite?? i liked emily, too! my favorite now is probably kacie b., but i think nicki seems like a sweet girl as well. blehhh to courtney! Yeah I like nicki too. I checked out Courtney’s modeling home page the other day (http://www.courtneyrobertson.com/Site/Home.html) and now I think she’s even more blehhh! This looks so GOOD! I can’t wait to try it!!! This looks so yummy! I saw wheat berries in the organic aisle of the supermarket and wanted to buy them, but decided to hold off until I know what to make with them. This looks like a winner! Ooh, that recipe looks delicious! I’ve been wanting to try out wheat berries – this might be my first attempt. And I’m with you on the college Jeopardy (or even high school, haha); I feel much smarter when I watch those episodes! Oooh, nice photo there, Julie! I’m always so impressed with your food-on-a-fork photos. 🙂 Recipe looks yummy! Gosh, that looks delicious! And very easy, as well! I cannot WAIT to see who goes home tonight!!!! What about trying to cook food items you have never made before? Have you cooked Indian food? idk it could be fun for you and ryan to do together! do you have any “first timer” dish recommendations? i’d love to try but i’m a little intimidated! and I think you can find most things at a local grocery store? And I would let the chickpeas simmer a bit longer, you want them to be tender when you eat them. 🙂 I want one now and it’s only 8:31am! Haha I’m the same way with Jeopardy. I also get frustrated when watching with my husband because he always answers faster than I do!! 😉 His brain registers much faster than mine! I do the same thing – I love using my blog as inspiration for recipes whenever I’m in a rut. It always reminds me of fantastic recipes that I may have forgotten. This looks delicious!! LOVE the mushrooms, looks so hearty. Hope you had a great holiday! yum. 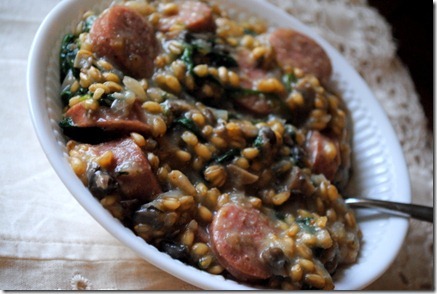 love both wheat berries and risotto, so i’m sure this would be delicious! Look at you go! I always forget to make old recipes – seriously, I make them once, post the recipe, and move on. I feel like I need stop that!!! So excited about this recipe!! I love love love your butternut squash mock risotto so I’m of course excited for another variety that, once again, incorporates some of my favorite veggies! i love that you watch Jeopardy, too! I miss the college tournament as well. Although, I guessed a final jeopardy correctly last week during one of the teacher tournament shows and was pretty proud of myself 😉 that rarely happens! Your dinner looks yummy! I have some wheat berries just chillin’ in my pantry…that would be a great way to use them! This looks so yummy – I still have to try wheat berries, they look good! Looks great! Do they sell wheat berries in the normal grocery store or do you have to go to a specialty store? i think i got them at whole foods. i’ve had them stored in a jar for a long time now! Yum!! This looks absolutely amazingggg. That looks so amazing! Great idea! Ohh, nice! I love how you tell us to make this vegetarian. So nice of you! I love how intricate this looks and yet how easy it is to make. I totally need to try this! Do you think I could substitute white beans for the sausage? definitely! sounds like a great idea to me. How funny! Just yesterday I was thinking about your butternut squash risottos and how much I’ve been wanting to try them. Now I really want some lol. Jeopardy makes me feel so dumb lol! This sounds yummy- I’ve never tried wheat berry but it looks kinda like pearl barley?….or am I completely off? the texture/taste is actually pretty similar! I geek out and can rock regular jeopardy. Its quite pathetic how much of a dork i am! I’m loving the creativity with wheatberries! So I am also a Quinoa Freak, and was curious about how Wheat berries compare in cooking time. I have found when you put Quinoa in the rice cooker and “set it and forget it” it turns out great. I’m wondering if wheat berries would fare the same. I might just have to try it this week. aw, thank you, raquel! sadie is honored! This recipe looks GREAT! 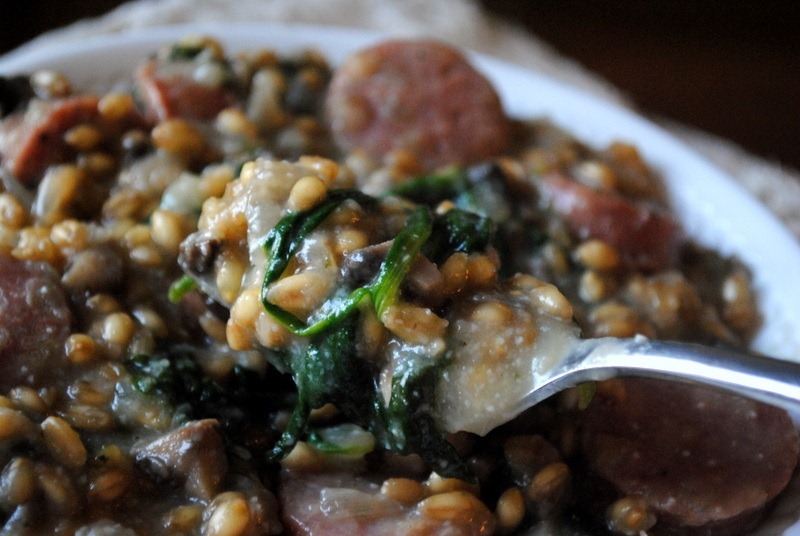 I’ve never used wheatberries before but I love everything in this recipe. A question — did you soak your wheatberries before using, and do you recommend red or white? I made this for dinner and it was delicious! I used kale instead of spinach and muenster instead of parmesean because that’s all I had, and omitted the chicken sausage, and it still turned out great! I just made this recipe and this is so so good!! I had never had wheatberry before and I really liked it. Keep the great/creative Recipes coming! I’m new to your blog and absolutely adore it! 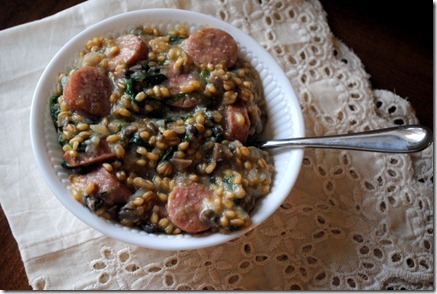 I tried this recipe for dinner tonight and loved it! I’ve never had wheat berries before and they were still pretty firm when I ate them, is that normal, or did I not cook them long enough? topics talked about in this article? I’d really like to be a part of group where I can get feedback from other experienced people that share the same interest. If you have any suggestions, please let me know. Thank you!